When you are using class selectors for a DOM element which already has a class then awesome I don’t have to add any more classes. Using this bootstrap example there are multiple classes I can get a hold of to manipulate the dialog contents. Well no duh – brilliant idea! In this article I will demonstrate how we can use the same REST service we used to populate our grid, to accept an update to one of the row values. In the last article we saw how we can easily create a context menu and in this article we are going to add the icing on the user experience – updating the data on the server via a REST service. Once again in this incremental series, this is a small mount of additional effort to effect a large benefit for the end user experience. In this handler we get the selected document, and pass that “selection” and the status value to be updated to the buildSubmit.updateREST function. and the JSON is successfully sent to the REST service. Once again a few simple lines of code provides a huge benefit to the user. If this is the only point you take away form the this article this is the most important. Reloading grid data has a cost, in data consumption on the server, time expended to download, time to redraw and most importantly time wasted for the user getting a confirmation that their data was updated. If you have a large number of data rows and the update is in the order of seconds then the user has to wait. Updating a single field of data is instantaneous and the user experience gratification is immediately satisfied. If you are updating data within the grid itself – DO NOT reload the grid data from the server – EVER – plan your user experience better ! 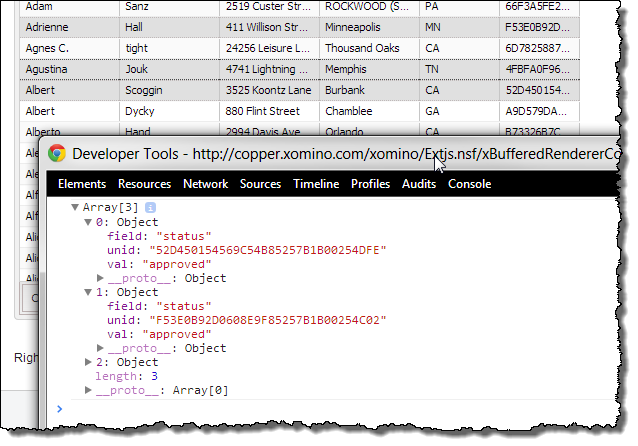 Using the jsonviewservice out of the box EXTLib REST service allows me to make field updates to the database with a tint data footprint. I cannot understate how awesome #3 is ! Why “we need to reduce clicks” is sometimes a fallacy. August 19, 2013 Marky Roden Just Marky, Productive or Lazy? In this article i will discuss why I believe the phrase “we need to reduce clicks” is a fallacy (at times). The plain statement of “we need to reduce clicks” really does not tell the whole truth about an application when it comes to modernization. I believe the true statement is that “We need to reduce clicks that annoy us“. There is a very clear distinction in my mind and I will try and explain. It is all about design and the user experience. When a user has to select a piece of information and then “action” it, that is probably at least two clicks. Two clicks is two clicks right? In all of these situations the user only has two clicks – but in a decreasing level of annoyance the User Experience gets better and better. that is two clicks too many and we could reduce the number of clicks (but how long does that REALLY take? less than 30 seconds at best). But is too many clicks really the problem? No I don’t think it is. The problem lie at the heart of efficiency, expectation and patience. So what’s the real problem here? The user perceives that they only has a fixed amount of time to dedicate to “having to do their job” and if Approval of something is their responsibility they want to get it done as quick as possible. In today’s business when local LANs are lightning fast the pages refresh quickly. Time itself to do the approval is in the order of seconds, even in the worst case scenario. But the perception of time taken to achieve the necessary “action” is verbalized as “need to reduce the number of clicks”. “Reducing the number of clicks” is sometimes a fallacy, improving the user experience of the same number of clicks they have to do to get their job done should be the real goal. One actual way of reducing the number of clicks by 50% (from two to one) would be to add “drag and drop” to the document and have the user drag the document to an “Approved” landing area – I am not sure that would improve the experience though. In this article I will discuss and demonstrate how to create a context menu so that when a user right clicks on grid they are able to take action. If the user is in a grid and has to select some documents, then move their mouse out of the grid and click an “Approve” button that is “one click” but “with an annoying mouse movement”. Right click – select Approve is actually two clicks…..which is more clicks but is less annoying because of little to no mouse movement. I will get to writing about how to do the update like I promised……but suffice to say that this is posted at a customREST control which will then update the values based on the UNID. The menu is smart enough that if you do not click on the menu itself it disappears when you click away from it. 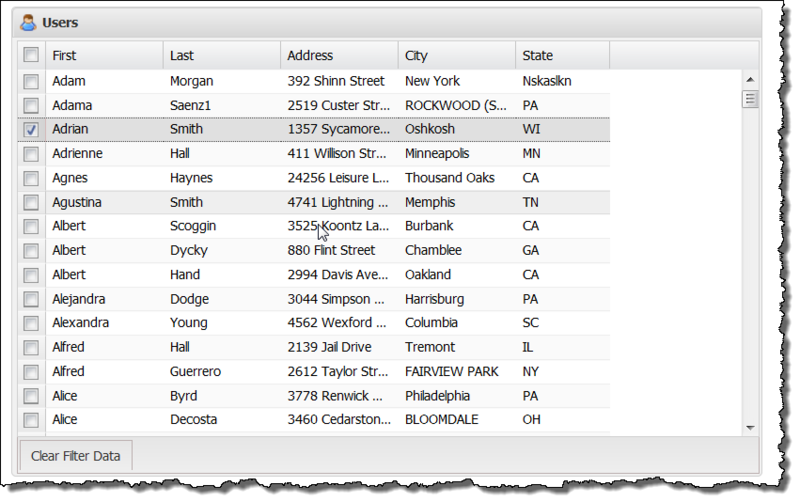 In this article I will discuss and highlight “multiselect” within the extjs grid. 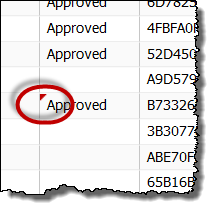 With a two line addition to the grid code we are able to select multiple documents and then action them. 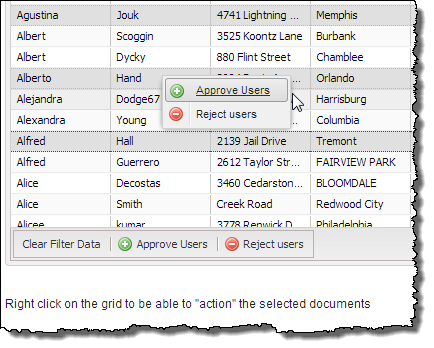 To be able to action more than one document we want to be able to select more than one in the grid. There are two ways we can do this and we are going to look at both. In the next article we will look at how to affect change to multiple documents. As you can see from the above picture the multiple selected documents are all highlighted. In this article I will demonstrate the ability to edit data within and EXTJS grid and have the changes saved directly to the domino database via the same REST service from whence they came. I have to say a big thank you to Steve Zavocki who actually found my old failed attempt to make this work in my demo database. It was unblogged because I couldn’t get it to work – well that was in April, he asked some questions about it and I came back to it and with another 4 months of EXTJS experience under my belt I figured it out in no time. Without the prompting it might have sat there for another 4 months untouched. 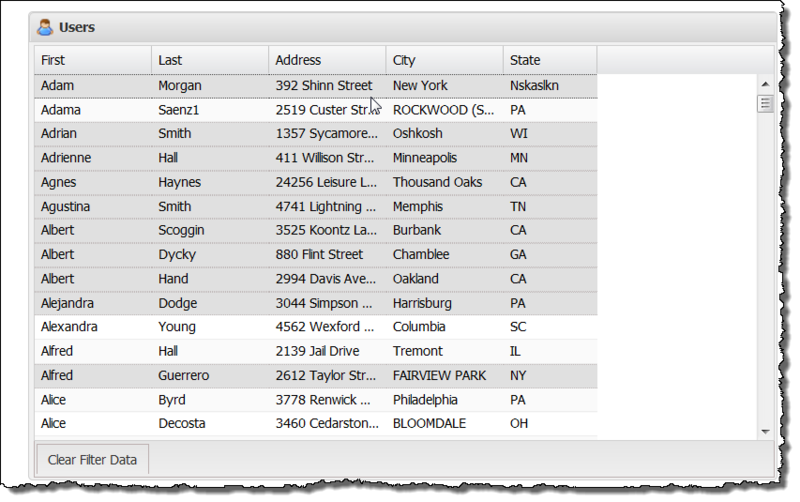 and as simple as that you can now double click on a grid and edit the columns! As you can see it also defines the write format back to the REST service. When you click on the UPDATE button on the row editor a URL is generated and data is sent. It does this via a “PUT” request which only sends a small amount of data to the server. It is important to note that the grid automatically adds a “page=1” parameter to the REST service call and for some reason I cannot fathom this makes the REST service fail! so I added the pageParam to the store proxy config and told it to use “p” instead – “p=1” apparently means nothing to a REST service and we all carry on happily…. and the UNID comes from where exactly? To do this I added the UNID as a field in the REST service and added that as a hidden column in the grid. 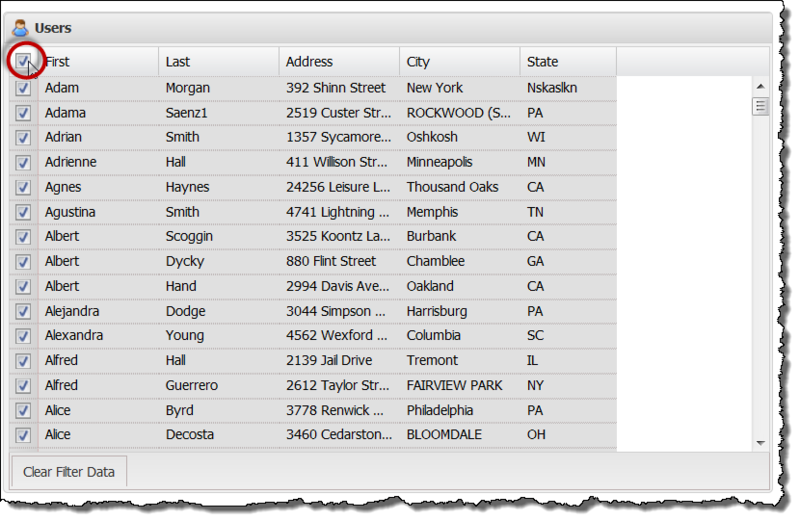 And that is pretty much it – you can download the sample database and take a look at the code for yourself. If you want to get really fancy (and we will in the next blog article) you can also edit numbers/date fields and add validation as well to ensure that your users and not submitting rubbish back to the REST. If you want to be uber secure as well there is always the querySaveDocument event on the REST service which you could also use to validate the incoming data. In this article we have seen how we can easily edit data directly in the data grid and from that we can update our domino data with a tiny http post back to the server. This is good for your network traffic and fantastic for your user experience.